I’ve been using process analysis to develop a draft strategy for Fantasy Football. I’ve already shown that getting a top running back should be your first priority. But what if the top running backs are gone by the time you get your first pick? When should you switch to other positions? I’ll use Minitab to find out. We already established that getting a top running back should be your highest priority. But if the top running backs are gone, we need to look at the next highest group. Yep, it’s important to grab a top tight because there is a big drop off from the top guy to the 5th guy. Obviously you don’t need to do this in the first few rounds. But if there are any stud tight ends, the numbers say to make sure you get one. This is the position to go for in the first round if you think the top running backs have already been taken. In fact, you should make it a priority to get a quarterback even if your first pick was a running back. You’ll notice the standard deviations in the other positions decrease as we get to the more average players. But this is not true for quarterbacks. Even if you miss out on the top 5 guys, you want to grab the best available because their value keeps dropping at a large rate the entire way through the draft. The biggest takeaway from this analysis is that you should ignore receivers early in your draft. Of all the positions, they have the least amount of drop off in fantasy points from top to average players. In fact, the numbers say it’s more important to grab the 11th best running back than it is to grab the top wide receiver! Sure, you’re not going to get Roddy White or Andre Johnson, but you’ll do just fine taking Mike Williams or Jeremy Maclin later on. Now this doesn’t mean you should always blindly choose quarterbacks and running backs over a receiver. Maybe you’re really high on BenJarvus Green-Ellis as your second running back. Because he’ll still be available later in the draft, it would be smarter to take a receiver first and pick up Green-Ellis in a later round. And remember, last year Arian Foster was on average the 20th running back selected. 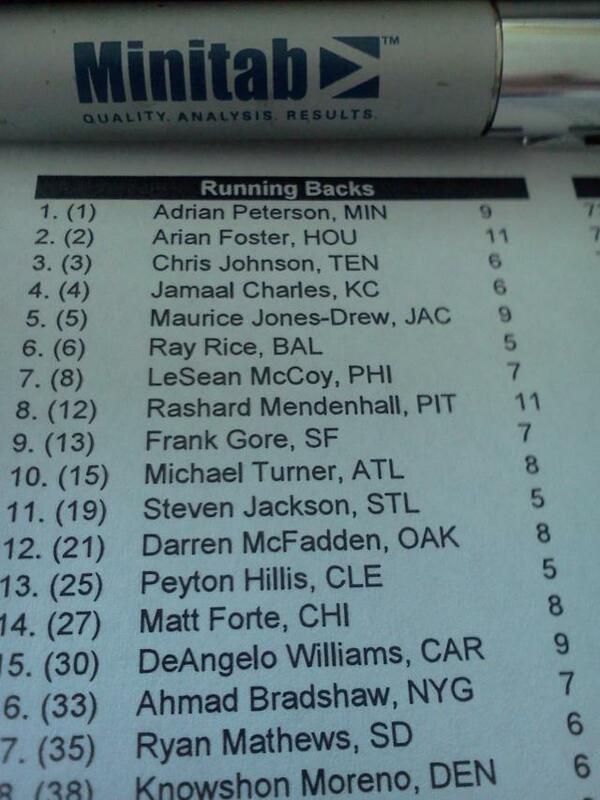 Two years ago, Chris Johnson was on average the 8th running back selected. And three years ago, DeAngelo Williams was the 31st running back selected! You don’t have to pick a running back early to get a top running back! So the statistics say to concentrate on elite running backs and quarterbacks early. Even though you will sacrifice getting an elite wide receiver, the amount of points you give up will not be nearly as much as the other way around.